The Toronto ad agency’s new home is located in a former turn-of-the-century light bulb factory. A nod to the building’s history in the reception area. Photo by Tom Arban. Like so many other companies seeking to modernize, ad agency FCB decided to ditch the 90 private spaces at their Toronto office in favor of a mostly open plan space that would encourage collaboration and creativity. The resulting office design, courtesy of Bartlett & Associates Ltd., is nothing short of inspirational. FCB’s new home is located in a space that has a former life as a turn-of-the-century light bulb factory. As both a nod to the building’s history and a reminder of FCB’s mission of creativity and innovation, an enormous light bulb with the agency’s name as the filament greets both employees and customers alike as the walk in the entryway. 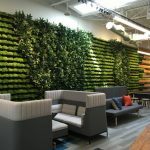 The building itself offers a variety of spaces for employees and customers to meet and work, from grabbing an informal cup of joe at the Market Square Coffee Bar to meeting formally in the Boardroom. FCB has been thrilled with the redesign; the company’s creative director raved that “the increase in energy was literally overnight”. The Market Square Coffee Bar, with the Boardroom off to the right. Photo by Tom Arban. Inger Bartlett and team, Bartlett & Associates Ltd. The primary design was completed from 2012-2013, but the project is ongoing with updates. The reception desk. Photo by Tom Arban. The target was 150 square feet per person. There are about 250 employees, and all are daily. A work area. Photo by Tom Arban. The Dufferin Street bus service and streetcar lines on nearby Queen and King Streets provide quick and easy access to subway lines and the downtown financial and entertainment districts. Go Transit’s Exhibition Station is within walking distance. The 136-year-old Canadian National Exhibition, one of the largest in North America, is held less than a half mile away. The area is a growing hub for tech start-ups, agencies and media production companies. About $65 per square foot. The project used Knoll, Keilhauer, Tusch Seating, Artopex Inc., and Westbury and Eureka Lighting, in addition to some custom work. Is there a mobile work or work-from-home policy or are most employees there all day, every day? There is no official work-from-home policy. The stair linking together both floors. Photo by Tom Arban. Stair detail. Photo by Tom Arban. None of the space is unassigned. The very first image seen upon entering the space is a giant light bulb, reflective of both creativity and of the building’s original use as a light bulb factory; it’s obviously a great tie-in. 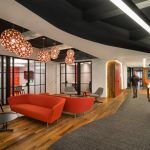 The visual impression of energy, light and openness from the design also transfers readily to employees beginning with the recruitment/interviewing process. It’s an innovative, modern, open space echoing a brand known for its open, creative minds — ideal in the ad business. View from the Boardroom to Market Square Coffee Bar. Photo by Tom Arban. The most unique feature is either the dramatic self-standing staircase with folded steel treads connecting the two floors or the open mezzanine meeting area positioned one-half story above the open-ceilinged main floor. The agency was previously located in a midtown Toronto space with 90 closed offices. This was transitioned to a space with 15 offices, with most employees in open space. Most people think the new space is bigger than the old, though it is actually smaller. According to management, the move had a profound effect on the agency’s culture by encouraging spontaneous collaboration among staff. Looking down to the lower floor. Photo by Tom Arban. Mezzanine/staircase complex that transitions two and one-half floors. As requested by the client, the space is multi-functional: Reception, Market Square, the Boardroom, Creative Department lounge, and Mezzanine breakouts are all suitable for informal staff gatherings and town halls, which drives a sense of corporate community. In addition, the layout provides multiple ways to engage clients (informally at the Market Square Coffee Bar, in the more formal Boardroom and in Creative breakouts). Next articleCould You Have Imagined Offices with Slides and Swings in 1976?